[Urban Classroom] Whitney Anne Postman, PhD (Linguistics)/CCC-SLP, and Janet Brodie, M.A., CCC-SLP - Psycholinguistic Technologies, Inc. In 2010, we conducted the first attempt to incorporate SentenceShaper into school-based Speech-Language Pathology. The program was used with school-aged children of different levels to address a variety of speech and language capacities– for example high school students who stutter improving fluency in expository discourse, 6th grade students refining articulation of late-acquired sounds in narrative contexts, and 1st grade students learning use of pronouns and verb tense in simple sentences. For the 4th grade students’ treatment sessions, we trained them to use SentenceShaper and asked them to create audio essays on the life and legacy of Thurgood Marshall. The five students had significant speech and/or language delay, aged 9-11 years and at the 4th grade level. For their audio essays with SentenceShaper, the boys were asked to record descriptions of events in the life of Thurgood Marshall, with commentaries on his legacy. They found this theme to be motivating, novel and relevant. As their reward, their SentenceShaper recordings were saved onto CDs that they showed off in school before taking home. In developing their audio essays, the students trained articulation (complex words and phrases: ‘racial segregation’; target sounds: ‘THurgood Marshall’); lexical semantics (new words: ‘tuition’, ‘attorney’; proper names: ‘NAACP’; phrases: ‘death penalty’); morphosyntax (variety of complex sentence structures: infinitival complements, causatives, passives; tense concordance across clauses, aspect, mood inflection); discourse organization (linguistic means of conveying flow of ideas: connectives indicating temporal/causal order, factual conditions) and fluency (fluent production of extended discourse). During the students’ virtually independent use of SentenceShaper, they carefully listened to each trial and noted any errors and disfluencies. They then re-recorded their sentences using the fluency techniques learned in therapy, until they were free of disfluencies and errors. 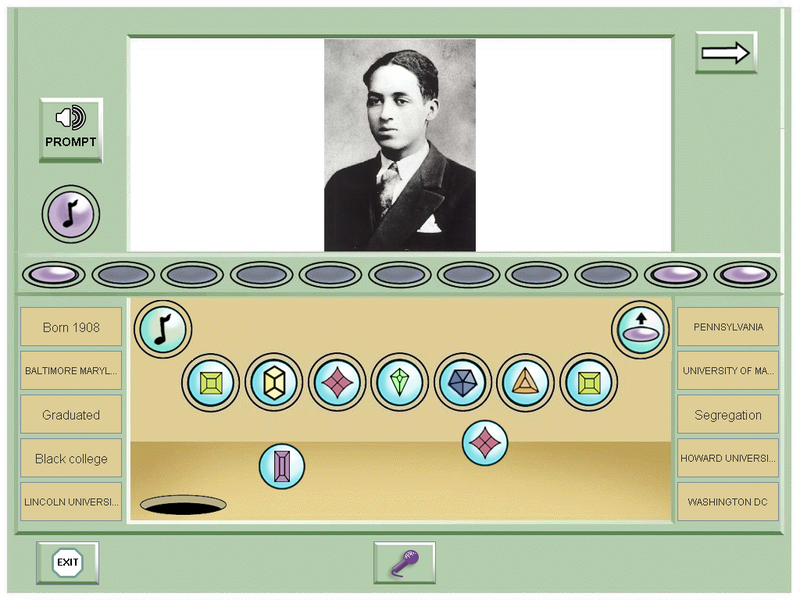 All five students were captivated by SentenceShaper’s child-friendly interface, including fun icons to manipulate and pictures of their choice imported from the Internet (e.g., of Thurgood Marshall as a young man working with the NAACP). Buttons were created to target specific lexical/functional items (e.g., a button to play a recording of “Supreme Court”). In these ways, SentenceShaper could be appropriately tailored to address the linguistic and cultural backgrounds of diverse students. The visual-iconic representation of students’ recordings maintained their attention and supported students’ working memory by offering continuous access to previous recordings. Students enjoyed saving their voice recordings as “chunks” appearing as “jewel” icons. By clicking on the icons, they heard themselves instead of their teachers! They compared their own recordings and deleted those deemed unsatisfactory. Thus SentenceShaper increased the students’ awareness of and attention to their own speech. It fostered self-monitoring and self-correction, as well as a sense of pride in tracking their own progress. 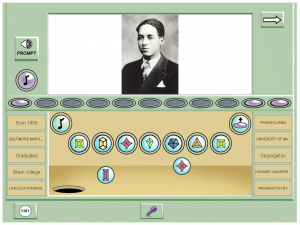 Under the therapists’ guidance, the students combined, sequenced or re-organized the icons of their recordings. These manipulations highlighted for students that language is essentially combinatorial and compositional. As a result, they gained metalinguistic knowledge as well as a sense of control over their own speech and language output. In sum, SentenceShaper provided the students with multiple training benefits. These experiences suggest that the clinical utility of SentenceShaper in the school setting is worthy of further investigation.